The Great American Eclipse is arriving Monday. If you've talked to anyone who has experienced a total solar eclipse, you've probably heard it described as eerie, inspiring, or spiritual. People who have seen it might even tell you there's "no excuse" for missing it. It's a strange experience to have a sudden night thrust upon you in the middle of the day. Birds stop chirping, animals might panic, the wind changes directions, and as co-chair of Southern Illinois University’s Solar Eclipse Steering Committee Bob Baer said, "About halfway through, people will wonder if the sun is ever coming back." From those descriptions, it's not hard to understand why ancient civilizations had what we now view as strange beliefs surrounding the eclipse. They dug deep to understand why this is happening to them. Dr. David Dearborn, an astrophysicist at Lawrence Livermore National Laboratory, told the New York Times many cultures saw the eclipse and thought, "This is something wrong. We’ve got to figure out what." Those explanations took many forms. Ancient Greeks believed an eclipse was a sign the gods were angry. In China, before there was a more modern understanding of the event, it was believed a dragon ate the sun. The eating of the sun and the subsequent return of the sun via vomit, in different forms, was a popular theory in many civilizations. Just as often as the eclipse was a sign of pissed off deities, it portended the apocalypse. The Ch’orti’, indigenous Mayas, believed an eclipse lasting longer than a day would come and produce a zombie apocalypse. You know, the usual dead rise to eat the living kind of story. They would have made some killer prestige TV. You can have a good time laughing at ancient cultures and their strange beliefs from time to time. But the power of the eclipse hasn't lost sway over humans. Many people still get a spiritual feeling from the celestial event. Some even continue to believe in the apocalyptic power of the eclipse. David Meade is one of a handful of people who believe the eclipse will be the start of an apocalyptic event culminating on September 23. Meade believes Nibiru, a hidden planet sometimes referred to as Planet X, will crash into Earth and spell doom. It probably goes without saying, but let's say it for good measure. Scientists don't believe Nibiru exists. In fact, NASA calls Nibiru and Planet X "an internet hoax," noting that if it was there, they'd have been tracking it for at least a decade. But Meade, who is conveniently promoting a Planet X book, says he's found proof in the Bible. Earlier in the year, he predicted the end would come in October, but he's bumped the prediction up to September. "The Great American Eclipse of August 21, 2017, is a major - huge - harbinger," Meade told The Daily Mail. In addition to Biblical evidence, Meade cites something called the "33 Convergence" as evidence. That's a string of coincidences involving the number 33. "When the eclipse begins on August 21, the sunrise will be dark, just as Isaiah predicts," he said. "The Moon involved is called a black moon. These occur about every 33 months. In the Bible, the divine name of Elohim appears 33 times in Genesis. "The eclipse will start in Lincoln Beach, Oregon – the 33rd state – and end on the 33rd degree of Charleston, South Carolina. Such a solar eclipse has not occurred since 1918, which is 99 years – or 33 times three." Also, I got 33 emails before 7 am today and Patrick Roy, who once wore 33, quit his job with the Colorado Avalanche last summer before the season began, and then Gabriel Landeskog scored 33 points that season. You might let that go until you realize both the Buffalo Sabres and Detroit Red Wings won just 33 games but finished ahead of Colorado. Of course, that wouldn't mean much, but then the Stanley Cup Champion Penguins signed Greg McKegg this summer, who wears, you guessed it, number 33. If this all freaks you out (it shouldn't), it's probably safe to assume you're going to be okay. Nibiru was supposed to crash into the Earth on December 21, 2012 (the Mayan apocalypse). That date was picked after Nibiru didn't crash into Earth in 2003 as predicted. 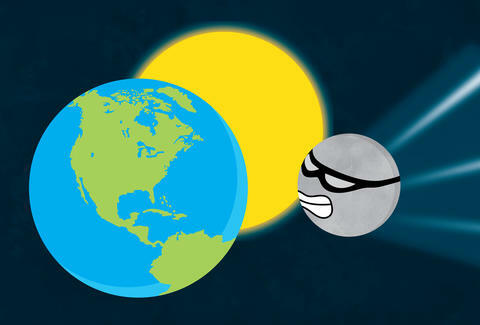 Last year's string of super moons was also predicted to be the harbinger of Nibiru's arrival. In many cases, a good deal of the supposed evidence involves conspiracy theories, cover-ups, and photos of lens flares said to be the planet hiding in plain sight. (Imagine the excitement they might feel watching a J.J. Abrams movie!) The constantly changing date of our collective doom makes Nibiru theories feel an awful lot like The Reasonabilists on Parks & Recreation. You have more to fear from crappy eclipse glasses and drivers trying to sneak a peak at the sky while cruising down the highway. But just because we're likely to still be paying bills, eating ramen, and farting in our sleep on September 24, don't forget that eclipses have legitimately changed the world and advanced science. It was actually an eclipse that allowed Edmund Halley to prove Issac Newton's law of gravity to their contemporary skeptics. Later, a theory about Mercury's wobbly orbit suggested there was a secret planet we couldn't see because of the brightness of the sun (it was not Nibiru, sorry). That planet, preemptively dubbed Vulcan, wound up not existing. Albert Einstein was able to explain Mercury's orbit with the General Theory of Relativity. An eclipse in 1919 helped him convince skeptics. An eclipse is a powerful event that can change the world and inspire. So, it's easy to understand how wild beliefs have sprung up around the awe-inspiring celestial event. That's part of the reason it's worth getting out there to understand it for yourself. But don't get worked up about your pending doom at the hands of a rogue planet.